I am now thousands of dollars poorer than I was yesterday. But, I got my bike! It has been a long and drawn out process. When I decided to get a bike over a month ago, I had no idea what was involved, or how much to spend, or that a tri bike was different to a road bike. I asked all my riding friends for reccomendations on bike shops, and who to see there, and then proceeded to visit them all. In the end, I chose a Specialized Alias from Velofix at Rozelle in Sydney. After more reccommendations from friends, I decided to book in for the body geometry fit with Anthony when picking up my bike. Wow, was it comprehensive! It went for over 3 hours! Worth every cent. Body Geometry Fit – worth it! It began with a pre-fit interview. Then, we measured my sit bones, with the aid of a memory foam pad. After this we assessed my flexibility and strength. I felt a little overwhelmed when choosing pedals. (Who knew that bikes don’t even come with pedals – like they are some kind of optional extra or something!) Some of the pedals cost up to $400 (They have carbon blades – at least they sound cool!) I went with the mid range pedals. Then it was time to jump on the bike! First up was the side view analysis. We adjusted my seat height 3 or 4 times, to get the knee angles right. There was a discrepancy of about 2 degrees on one side (one tibia is longer than the other by a couple of mm) so we put something in my shoe to account for this. We also switched pedals (to the cheapest ones) because they suited me better and I could clip out of them a lot easier. 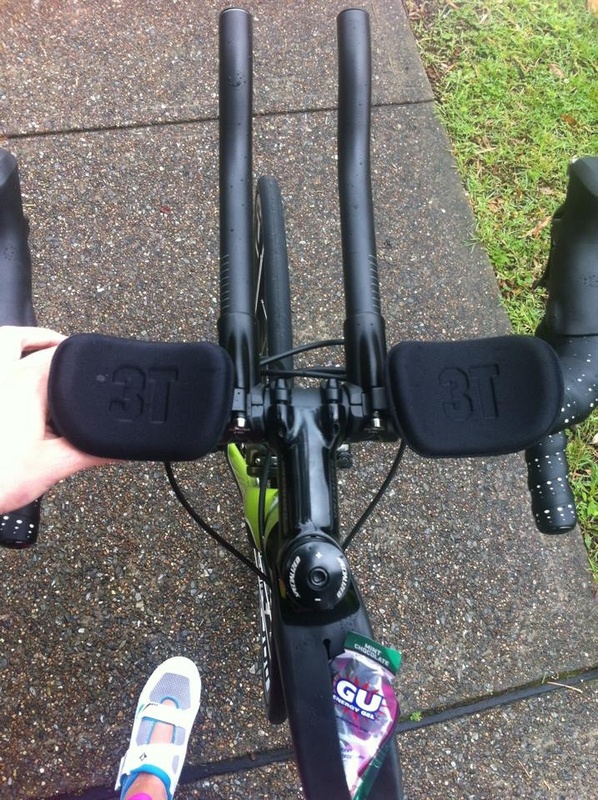 We also fitted aero bars to my bike to make it tri-ready! After that came the fun part of choosing the accessories for my bike! i got drink bottles and holders, and a ‘lunchbox’ for my bike, to store race nutrition, GU’s, etc. I also got some spare tubes, tools, a pump, CO2 canisters, and a bag to store it all in, and some cycling shoes. View from my cockpit… Note the ‘Lunchbox’ for my GU’s! I said “Don’t even tell me how much it all adds up to” as I closed my eyes and handed over the credit card. I’m sure it will all be worth it. I’ll be back in 2 weeks for my follow up appointment. Now, I just want it to stop raining so I can take my new bike out for a ride! 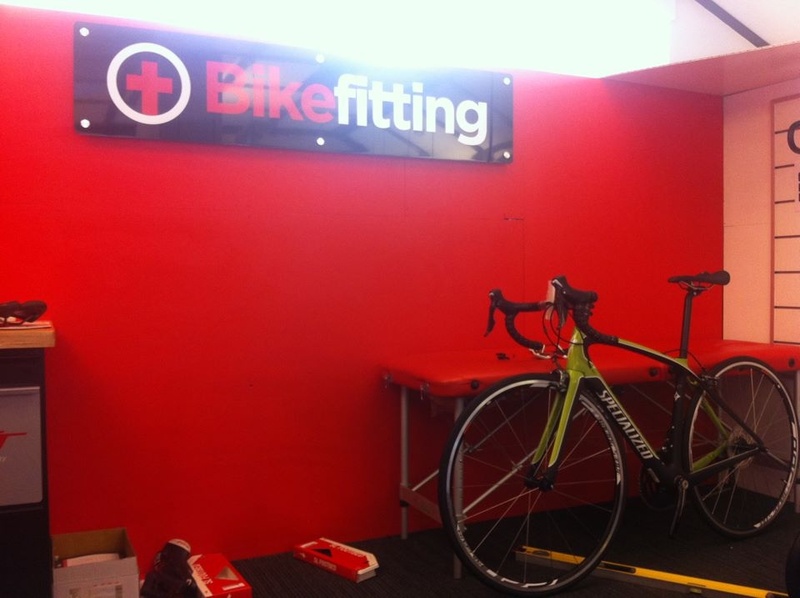 Even if you already have a bike, go there and get the body geometry fit done. Worth it! Fantastic, so glad you got the whole fit thing done. In a way you won’t know how much it was worth because you won’t go through the pain that a badly fitted bike can put you through. I hope it clears up this weekend for you. Happy riding. Thats true, I don’t have a poorly fitted bike to compare to…. But during the fitting I was just thinking, Wow! What kind of discomfort would I be in If I had not deided to do the extended fitting? !